Margaret Joyce Hand, ’52 and her husband, Joe, want to help Little Flower install air conditioning in the cafeteria. But they need your help. 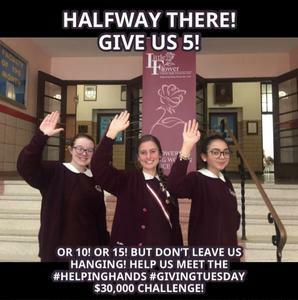 Marge has challenged the Little Flower community: she will match up to $30,000 on #GivingTuesday to help #LiftUsForward. But we need all “hands” on deck! Please join us so that together we can raise $60,000! Your donation can support any one of our important initiatives. We need your #HelpingHands!